Of all the wine regions I’ve had the extreme pleasure to visit, Spain’s Rías Baixas DOC (what does this mean? ), the west coastal home of the white Albariño grape, was the most memorable. From the way they grow their grapes, to the seafood culture, to the wide open possibilities of this beautifully acidic and quite underrated grape, the region holds incredible promise. These memories flooded my brain when I tasted the Valminor 2015 Albariño. In this small, green, lush oasis called Rías Baixas [REE-ahs by-EE-shash], the grapes wallow in over 50 inches of rain a year. In order to avoid spoilage, the fruit hangs far above the wet ground, and grape-tenders use granite support posts, rather than rot-prone wood, to support the vine canopies. 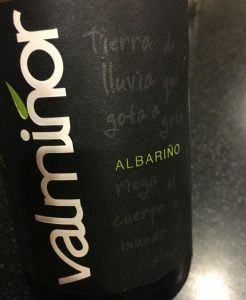 Albariño [al-bah-REEN-nyo] is their main grape — a finicky, aromatic, white grape that perfectly complements the area’s primary cuisine, seafood. I have two words for the Valminor 2015 Albariño: Absolutely delicious. And I have to add lovely. And lively. Aromas of tart citrus, fresh flowers and steely minerality waft from the glass while your tongue is awash in food friendly acidity, honeydew melon, red grapefruit, tropical, wet slate and green apple doused in lemon. Light bodied, utterly drinkable and food friendly. Refreshing, salavacious, serious without taking itself seriously, and oh-so approachable. Great effort for under $15 per bottle. Occasion: Enjoyed with Mahi Mahi in a citrus caper sauce. Sample sent from winery. Availability: Might be tough to find — high-end wine shops and possibly big box stores nationwide.